Two versions of the evening of June 24th at Pathum Wan police station in Bangkok are emerging. In one, Thai authorities are suggesting that a demonstration took place and that Thanathorn Juangroongruangkit assisted up to 20 student to flee the area before they were arrested for holding an illegal assembly. In the other, students report that they attended at the police station to file a complaint against heavy handed treatment by police and security personnel at an earlier protest. They claim they were told that they were free to go and subsequently were offered a lift by Thanathorn who was simply a businessman at the time. The stakes are very high for the 40 year old leader who has now emerged as a key player after the March 24th election as the leader of Thailand’s third largest party. Thanathorn has even been been suggested as a compromise choice for Prime Minister by opposition parties. The sedition charge served on him this week, relates to an incident on Wednesday night, the 24th of June 2015. Thai police have suggested this week there is already enough evidence to bring Thanathorn to trial. A conviction on the charge could see him jailed for up to seven years. It is reported that lawyers for Thanathorn Juangroongruangkit will present written evidence relating to the June 24th 2015 incident which is at the centre of surprise sedition charges against the young political leader which emerged this week. 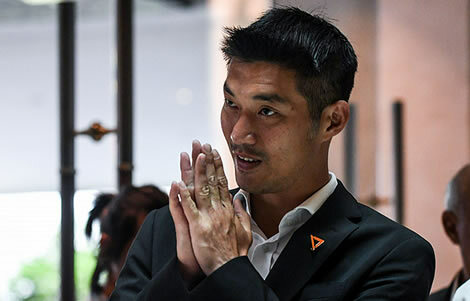 On the other hand, Thai police chief General Srivara Rangsibrahmanakul, who is a Deputy National Police Chief, has suggested that the Royal Thai Police already have enough evidence to bring Thanathorn to trial on the sedition charge. He has strenuously denied any suggestion that the legal proceedings are politically motivated. The leader of the Future Forward Party, Thanathorn Juangroongruangkit, will present himself on Saturday April 6th to answer a sedition charge raised this week by Thai police. Details of the incident behind the charge are now emerging. It relates to an incident that took place at a Thai police station in Bangkok on Wednesday evening, June 24th 2015. Thai police describe the incident as a demonstration at the police station by student activists. Today, Thai Police General Srivara Rangsibrahmanakul categorically denied any suggestion that the Royal Thai Police are pursuing legal proceeding against the radical new political leader, who at 40 years of age has emerged after the recent Thai election as the leader of Thailand’s third largest party, based on political motivations or influence. ‘It’s not about the elections or about discrediting anyone,’ he emphasised. The Deputy Chief of Thailand’s National Police explained to the media this week that the delay in pursuing the case was, in fact, due to a recurring change of investigators handling the matter. The police chief also revealed that their investigations into the incident so far have also involved Thathathorn’s mother, Mrs Somporn Juangroongruangkit, who is one of Thailand and the world’s richest women. She has already been called in by The police for questioning. He questioned why Thanathorn would be surprised by the development of the charges this week as he was well aware of police enquiries. It appears that the police investigation is focusing on an alleged effort by Thanathorn Juangroongruangkit to assist protesters in leaving the vicinity of the demonstration at the police station before they were arrested on the night in question. Under Thailand’s martial law period in 2015, public gatherings of more than 5 people were strictly illegal particularly if they involved political motives. The Thai police chief explains that it is the duty of police officers to investigate the circumstances surrounding the incident. Notably, the police chief has expressed a view that the police have already enough evidence to charge the political leader for sedition and bring the case to trial. He has also intimated that further charges, relating to illegal assembly, may also be examined. If subsequently convicted on the charge, the young leader could face up to seven years in prison. The stakes, therefore, could not be higher. Meanwhile, one of the students involved on the night of June 24th 2015 has come in the support of the Future Forward Party leader. Rangsiman Rome is a Future Forward Party MP candidate. At the time of the incident, he was a 4th year student at Thailand’s prestigious Thammasat University. He explained this week that he went to the Pathum Wan police station in Bangkok on that day to lodge a complaint. The complaint centred on the activity of police and security staff at an earlier anti junta protest held at the Bangkok Arts and Culture Centre. His version of the incident was that, while waiting for a taxi after making his complaint at the station, he was offered a lift by the young businessman and entrepreneur in his van. ‘I did not flee. I didn’t think I fled,’ he explained to the the Thai news website Khaosod this week. Thai authorities are insisting, however, that Thanathorn assisted up to 20 people to leave the scene which they describe as a demonstration. This was the version of events offered by a legal official assigned to the Thai junta, Colonel Burin Thongprapai, who suggested that the students at the police station faced arrest for conducting an illegal assembly. A lawyer for Thanathorn, Krisadang Nutcharut, has insisted that the young man was not helping anyone flee from the Thai police on the night in question. He said that the students had attended the Pathum Wan police station in Bangkok for the purposes of making a complaint. He added that the students were told by the police that they were free to go that evening. He promised to present written evidence to the police on Saturday to support his client’s case. Meanwhile, the Thai Deputy National Police Chief, has warned those considering attending the police station next Saturday that they must be careful not to contravene the law.